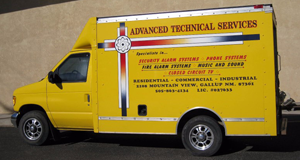 Advanced Technical Services has been locally owned and operated since 1982. We offer state of the art equipment & take pride in our superb customer service. We have been in business for over 35 years and our staff has 70 years of combined experience & knowledge. We install and service commercial & residential properties, offering a free no-obligation security analysis, along with design, sales, installation, service & lease agreements. Along with the alarm installation, which includes remote security access with a smart phone, we offer 24-hr alarm monitoring services. The monitoring company will dispatch the proper authorities whether it be the police and / or fire dept. Also, with our CCTV camera systems, we offer camera remote viewing with use of a smart phone or computer. Contact us today for a free, no-obligation security analysis.